American Steve Fossett set many records in his life, but surely the most impressive achievement was to circumnavigate the globe solo, non-stop, and in record time. That time was 67 hours, one minute and 10 seconds. His aircraft, the Virgin GlobalFlyer, was designed specially for the world record attempt. It was a wonder of engineering. Riccardo Mortara believes he can beat Steve Fossett’s record time in his own, aging, standard jet. 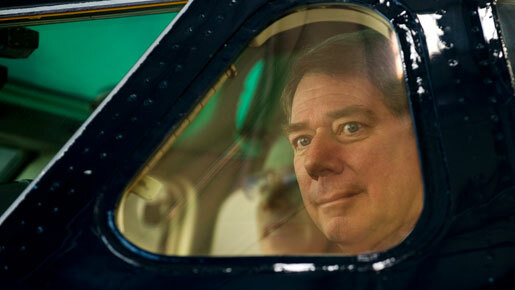 Captain Mortara, 62, is a pilot of 13,000 hours experience, and CEO of Sonnig SA, a Geneva-based private charter company. Among his fleet is the 30 year-old Sabreliner – the world’s first business jet. They’ve been together a long time, and the pilot has absolute trust in his machine. Together, they will take off from Bucharest on January 29, 2010 and fly eastbound. Of course, the Sabreliner – which is normally used to fly passengers in comfort – is not capable of a non-stop circumnavigation of the earth. In fact, it will require 10 carefully planned stops to achieve the distance of 36,770km needed to break the speed record, passing through all of the meridians. Those are the rules the Federation Aeronautique Internationale demand the mission abide by to achieve the record. Each stop will take around 40 minutes, and will see the plane touch down in Abu Dhabi, Colombo, Macau, Osaka, Petropavlovsk, Anchorage, Las Vegas, Montreal, Keflavik and Casablanca. The flight will be carbon neutral. Even though they look very different, with a max take-off weight of 10,886kg the Sabreliner is in the same class as the GlobalFlyer. The ‘Sabre’ is faster but, given its age and range, there’s no doubt it’s the underdog in this undertaking. “Myself and my crew have a burning desire to succeed in our endeavor, and whatever happens it will be the most exciting adventure for pilot and plane.” Captain Mortara will be joined by First Officer Flavien Guderzo who, at 26, has been mentored by his commander. Tom Zorman, 43, provides planning and support, coordinating the trip, monitoring weather and assessing all the risks. It was he who plotted the route. It was not an easy task. “Imagine taking a piece of string, 36,700km long, which you have to span across the globe, linking it to ten or more airports,” offers Zorman. “Whenever you move the string it becomes too short or too loose.I think we’ve selected probably the only combination of airports which will allow us to refuel and make the trip in under 67 hours. With the exception of Petropavlovsk, we are familiar with all the airports we’re using.” The mission is being sponsored by Romanian energy management company Selectra, and its CEO Nicolae Buzaianu has been a driving force behind the project. Nicolae takes a satisfied puff on a Cuban cigar. “Whether successful or not, you have to try. I’m a person who loves challenges and fierce competition, and so is Riccardo.” Indeed, Turin-born Mortara is no stranger to competition. He used to play professional ice hockey for Italy’s national team and, having graduated university with degrees in engineering, law and French, raced at the highest level in the World Rally Championship as a works driver for Volvo. Now his 22 year-old son, Edoardo, is making his own name as a racing driver. He races in the GP2 Series, the feeder to Formula One, and in 2009 won the prestigious Macau Grand Prix. “The thought of trying to beat the speed record for flying around the world first came to me while watching my son, Edo, compete at the Hungarian Grand Prix in July,” explains Riccardo. “I thought back to when I was racing and playing ice hockey; the buzz that I got from competition, from pressure. You need goals in life, and it’s good to set the bar high. In my youth, the goal was to play for Italy and to race in the WRC, and I was successful in these endeavors. Edo’s goal is Formula One, and I support his ambition. “My motor racing days are behind me. My life now is flying. But what, I thought, if I were to fly against the clock. To take on one of the greatest challenges in aviation – to be fastest around the world.” Forecasts say that the crew of Sabreliner HB-VCN could beat the world record by over nine hours, but mission controller Tom Zorman is quick to point out that forecasts are subject to change. “We will only have true knowledge of the weather we’re to face 48 hours before we fly, but when planning our route I researched weather reports for late January dating back for the last 40 years. So long as 2010 isn’t significantly different from its weather history, we should be ok.